The Presenting Sponsor – Dimensional Health Care Associates – donated $10,000 for Every Step Counts 2013. Dimensional Health Care Associates (DHCA) of Owings Mills, Maryland provides nurse case management and delegated nursing services to individuals with developmental disabilities. Another major sponsor, Corporate Brokers of Annapolis, Maryland donated $7,500 and has a team of over 30 walkers coming out to support Bello Machre. Sponsorship opportunities are still available for this great event. Volunteers needed for set up, route support, food service, greeters, parking, and clean up. Please contact Evette Watson @ 443-702-3064 or [email protected]. Volunteers receive complimentary food and t-shirt. Participate – each walker and biker will get people to sponsor their Every Step. Participants raise money by having friends, family, and business associates sponsor them to walk or ride. 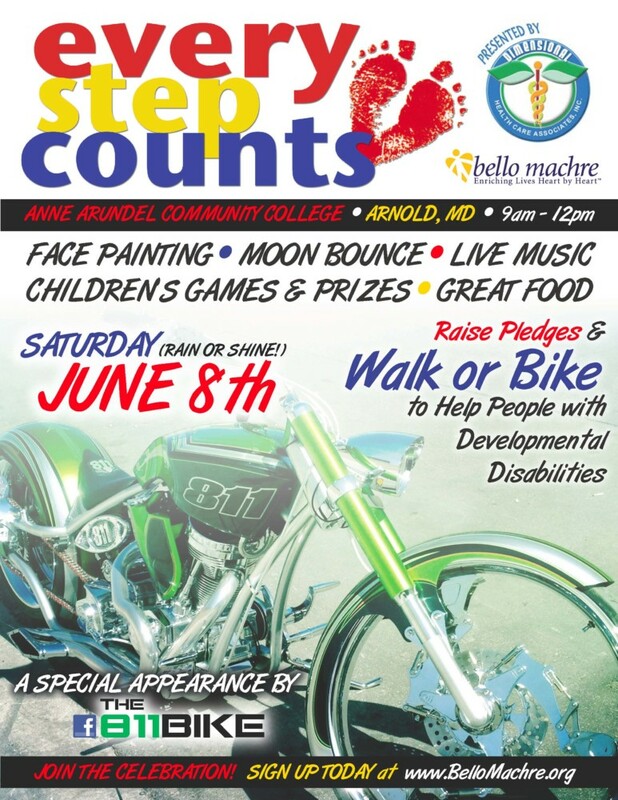 Registration starts at 8:30 am and the walk / bike begins at 9:00 am at Anne Arundel Community College in Arnold, Maryland. The entire event will wrap up by 12:00 noon. For more information – visit the Bello Machre website www.bellomachre.org or call or email Katie Gusa 443-702-3024 / [email protected].